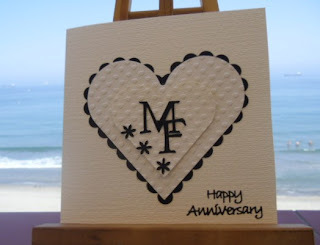 I love using these hearts for weddings and anniversaries too Sylvie... I think I would have used the capital M rather than the large m from the Cuttlebug Olivia alpha dies to match with the capital F.
FAB card Sylvie, you're not the only one that strayed from the rules this week! Thank you for taking the trouble to enter another card! Great card with lovely embossing perfectly done. Stunning black and white card Sylvie..very classy. Love the simple classy layout on this card. It's gorgeous. The hearts really set it off. Another lovely card and I hadn't noticed you had strayed from the rules until I just read about it!! Sylvie, the embossing and the double hearts looks awesome! Love this! Stunning! Very simple, very elegant and perfect for the challenge!